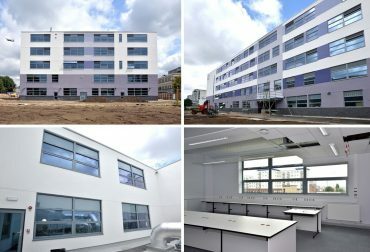 1st August 2017: First EFA Framework School for Bowmer & Kirkland Completes! We were delighted to have been selected by Main Contractors, Bowmer & Kirkland to deliver glazing to three schools located in Middlsex under their EFA framework. The schools include Kinglsey Academy (pictured above), Abbotsfield and Avanti School and have been designed by architects Pick Everard and Jestico & Whiles. Each school incorporates over 1,250m2 of architectural glazing systems that Dortech designed, manufactured and installed utilising Seniors high performance PURe glazing systems. The PURe® window range is a revolutionary new range of aluminium windows and doors which use an innovative, enhanced thermal barrier manufactured from expanded polyurethane (PUR) allowing ultra-low U-values to be achieved. It is a pleasure to be working on this scheme and we look forward to further strengthening our relationship with Bowmer & Kirkland.